Smith, Zachary Smith is his name, and flying a Type 40 TARDIS is his game. Zachary Smith woke on the morning of his 5th birthday to find his very own full sized TARDIS in his back garden in Somerset - and has become the envy of all his friends after becoming the proud owner of his own type 40 time machine. 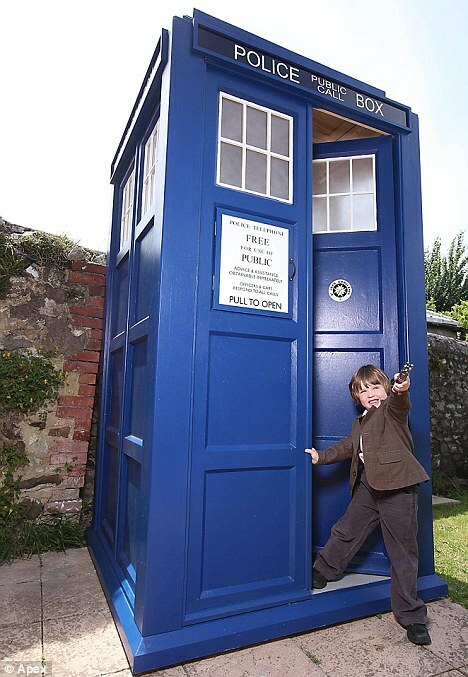 Zachary's TARDIS was constructed by his father Lee, 41, from Chard, Somerset, which took two weeks to with the help of Zachary's grandfather. Mr Smith, who works for Air Control Industries in Axminster, made the full scale TARDIS from readily available materials as a 5th birthday present for Zachary, who is a huge Doctor Who fan, along with his brother, Ethan, 12. His other brother, Oscar, nine prefers football. 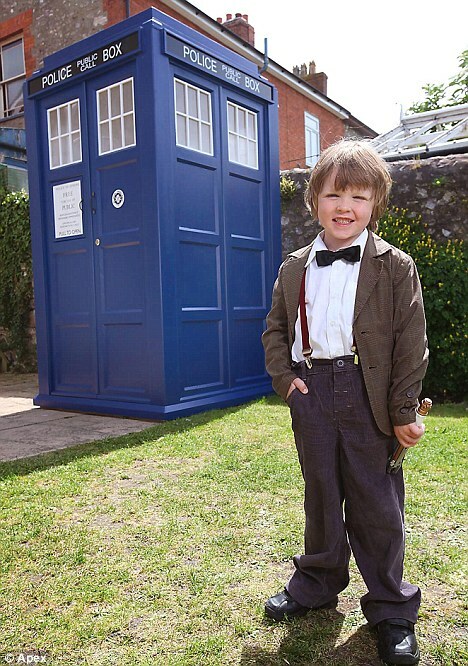 The TARDIS has been parked on the patio in the back garden and is the subject of much talk among Zachary's friends. His mother, Anna, 32, said: "It's amazing - really authentic. Lee is a perfectionist so it had to look just right. Zachary was absolutely gobsmacked when he saw it. He's been thrilled ever since. He's a huge Doctor Who fan and loves Matt Smith. We managed to get together an authentic costume for him too." Said his father Lee, "All his friends compete to see who is going to be the Doctor when they visit now. I have had the idea to do this for a long time as Zachary's such a big fan. But there's not many people who can say they have a TARDIS in their back garden so I quite like the kudos." Lacking trans-dimensional engineering skills, Zachary's dad wasn't able to make it bigger on the inside. "I was considering connecting it to the basement but thought better of it." Adorkable! We have a mini Doctor now. Mini Doctors are cool.